The java class version has been changed in Java 1.8. If you are running Java version 1.8 or above you must run Kmax 10.1 or above. Kmax 10.0 users may download the new version from the downloads page. In Kmax version 10.0 on the Mac (OSX 10.7 and later) double-clicking the toolsheet will not open Kmax properly. Gatekeeper is a new feature in OS X version 10.7.5 (and later) that attempts to protect your Mac from malware by denying execution privileges to applications downloaded from unapproved Internet sites unless they are properly signed. you have encountered GateKeeper. In order to run Kmax, you will need to temporarily allow unsigned applications to execute. 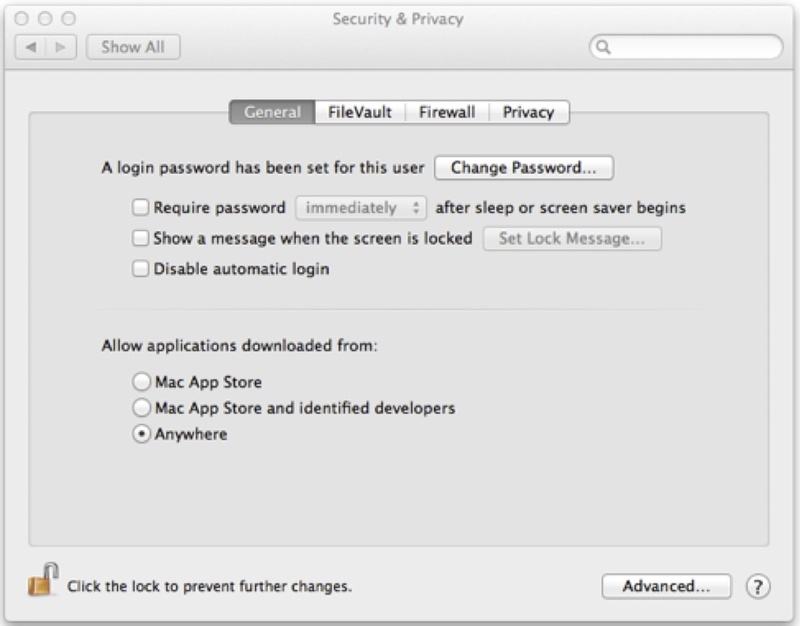 Bring up the “System Preferences” dialog and select the “Security & Privacy” item. 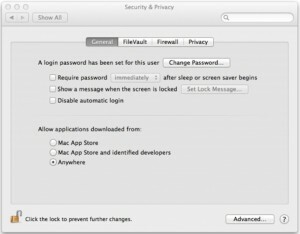 You may have to unlock the dialog in order to make changes. Select the “Anywhere” item to allow applications downloaded from unidentified sites to execute. Then control-click on the Kmax app and use the “Open” item to open the Kmax application. After you have opened Kmax for the first, return your settings to the originals for best system security. Kmax should now open properly. The Java 1.6.0 JDK/JRE (version 1.6.0_26 and above) introduced an image storage format that is no longer compatible with earlier versions used by Kmax. Kmax version 9.2 picture widget s used the older image storage format. Therefore, Kmax toolsheets containing Picture widgets which were last saved in JDK/JRE versions prior to 1.6.0_26 will not open properly when Kmax is running in JRE versions 1.6.0_26 and above. As of Kmax version 9.3, the Kmax toolsheet format has been updated to accommodate this change to image storage formats. Only the picture widget format has changed, so toolsheets that do not contain picture widgets are fully backward/forward compatible. In order to use toolsheets with picture widgets which were saved with Kmax 9.2 and the older JDK/JRE, picture widgets will have to be removed. First, open the toolsheet in an older JDK/JRE version with Kmax version 9.2.3 (or below) and clear all picture widget images. Save the toolsheet without the images. The toolsheet can now be opened with Kmax version 9.3 and above in JDK/JRE 1.6.0_26 and above. The images may now be imported back into the pictures widgets and the toolsheet saved. This newly saved toolsheet will be fully forward compatible. Note that Kmax 9.3 and above cannot open toolsheets (that have images) saved with versions of Kmax prior to version 9.3. Kmax distributions since version 8.x use Java methods to define runtime behavior and cannot run older toolsheets based on Command Sequence Language (CSL). The CSL scripts in older toolsheets must be replaced with the equivalent java methods.